After troubled beginnings, including early conflict in Samoa and the infamous dawn raids of the mid-1970s, the New Zealand–Samoa story is one of proud achievement. New Zealand Samoans star on the stage, in concert halls and art galleries, and on the sports field. And along with other Pacific Islanders, young Samoans are forging a vibrant new identity through music, language and fashion. Samoans came to New Zealand from two islands in Samoa: Upolu and Savai‘i. They are hilly, with palm trees and beaches along the coastlines. Samoa is a very Christian community, and there are many large and beautiful churches. New Zealand ruled Samoa from 1914 to 1962. In the 1960s and 1970s large numbers of Samoans came to New Zealand for jobs, many with temporary visas. In the mid-1970s, the police came into the homes of those who had overstayed their visas, and sent them back to Samoa. Samoans continue to come to New Zealand for work and to join their families. Two-thirds of New Zealand’s Samoans live in the ‘Pacific capital’, Auckland. Samoans brought to New Zealand their strong beliefs in Christianity and the importance of aiga (family). Their traditions are that children should respect, serve and obey their elders. Samoans work hard to maintain contact with family members across the seas. Some younger Samoans born in New Zealand cities have found it difficult to accept these rules. Unable to speak Samoan, they have found enjoyment and guidance in an urban culture with distinctive dancing, music, language and clothing. With other young Pacific Islanders they have made a new PI (Pacific Island) identity. Although Samoans are on average poorer than most other New Zealanders, many have been highly successful. They include playwrights and novelists, artists, sportspeople, and musicians ranging from hip hop to classical. 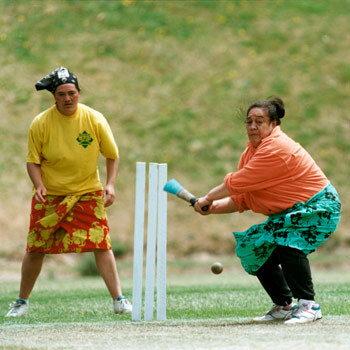 In all these fields Samoans have greatly enriched New Zealand life.